When remodeling your kitchen, it’s important to curate a design that’s functional, aesthetically pleasing, and withstands time. 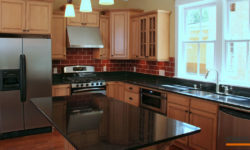 A good mindset to have is that a kitchen remodeling in Canton Michigan is like an investment. Each and every home improvement project you do on your home can add value to your home. Even a simple home improvement project such as painting a bedroom is an improvement that will have an impact on the home’s value. And for kitchen remodel projects in Canton Michigan the impact a kitchen remodeling project can have can be significant on your home’s value. A kitchen remodel project in Canton Michigan is a big project. Even something as simple as replacing the appliances in your home’s kitchen can cost thousands of dollars just in the cost of the new appliances. For moving, adding, or creating cabinets or simply just adding new doors on your home’s older cabinets can also cost depending on the style, material, and design you choose. However, getting a return on the investment can mean more value to your home, a more functional kitchen that you can enjoy, and more! 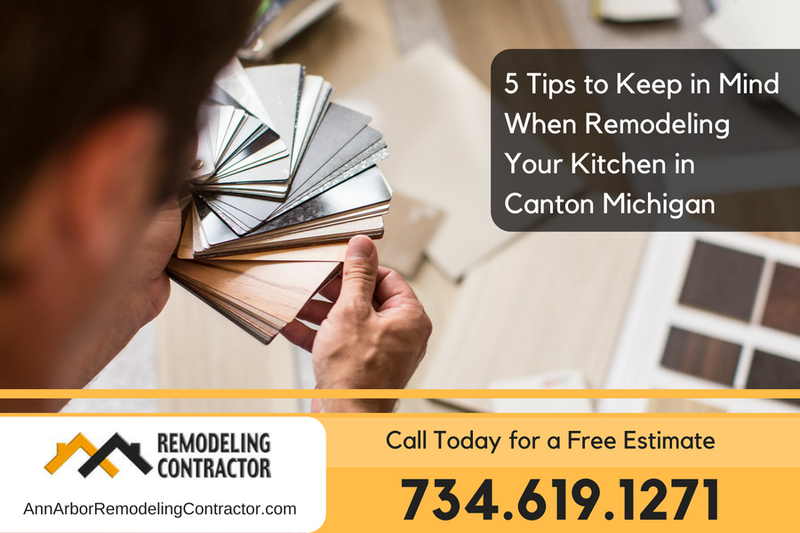 Be sure to check out the five tips you should keep in mind when remodeling your kitchen in Canton Michigan to give you a better idea of the kitchen remodel project that you will be doing at your home. Although stainless steel appliances look professional and luxurious, they tend to be expensive and actually haven’t withstand the test of time. In other words, stainless steel appliances have only recently become trendy in home kitchens and are already making their way out. 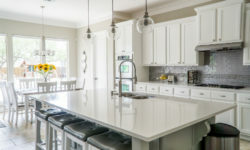 According to researchers, surveys have shown that white appliances continue to be the most popular color option when it comes to home kitchen appliances. Not only are white appliances traditional and popular, but they also tend to be more budget friendly. While majority of a kitchen remodeling in Canton Michigan focuses on aspects, such as counter-tops, appliances, and storage space, flooring also plays an important factor. If you’ve done a little research about kitchen remodeling, you’ve most likely discovered the pros and cons of vinyl flooring. While vinyl is typically cheaper and easier to customize than other flooring options, it doesn’t have a great lifespan and is easily prone to wear and damage. Contrary to vinyl, wood is a phenomenal flooring option that is classical, refined, and resilient. In fact, wood has one of the longest flooring lifespans and has a track record of looking beautiful even decades after it was installed. Plus, it’s one of the most comfortable flooring options to walk barefoot on. So, you won’t have to worry about feeling fatigued when cooking for a long time. Although it might seem like granite countertops are all the rave right now, they are making their way out of kitchen trends just like steel appliances. Aside from losing its trendiness, granite countertops are actually pretty expensive and tend to have a pronounced color and pattern that homeowners grow to dislike as the years go on. A great substitute for granite countertops is marble. While marble has pronounced whites, the soft gray and black colors work to balance it out. At a functional standpoint, marble is also one of the strongest countertop materials currently on the market. In fact, marble is known to not easily stain. Remodeling your kitchen is a great opportunity to maximize your storage space. Although traditional boxy cabinets might be great for storing standard utensils, they can’t really store much else. That’s why you should consider maximizing your storage space by installing pull-out organizers, open shelves, and even freestanding cabinetry. Lastly, don’t be afraid to target details when remodeling your kitchen. After all, you will most likely only remodel your kitchen once. So, why not make it perfect? Consider changing everything from your faucet seems to cabinet knobs and light fixtures. After all, you never know what changing the minor details could contribute to elevating your kitchen.